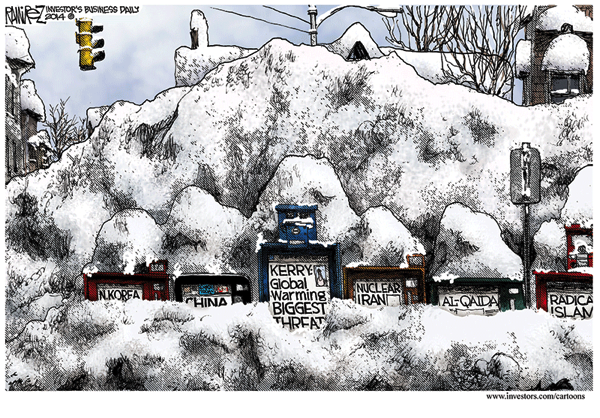 The Obama administration talks global warming as the world burns. 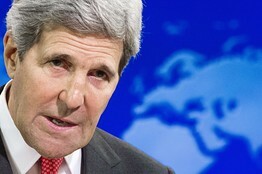 Secretary of State John Kerry said during his January 2013 confirmation hearings that he would be a "passionate advocate" on climate-change issues, and he's living up to that promise. In a speech this month in Hawaii, Mr. Kerry called climate change "the biggest challenge of all that we face right now." Not 10, 20 or 100 years from now—right now. If only Mr. Kerry were right. Unfortunately, America faces much bigger immediate challenges and threats than climate change. Our enemies around the world are intent on harming us—right now. America's secretary of state should worry more about them and less about the Earth's temperature decades from now. Here's a list of a few challenges, all of which pose a greater threat to the world than climate change. It might help the president and his colleagues understand why Mr. Obama's foreign-policy approval rating is about 36%, according to an August poll by Gallup. • Iraq is a greater challenge than climate change. While the president now likes to pretend that he didn't force a total withdrawal of U.S. troops, Americans remember his 2008 campaign promise to do exactly that. When the U.S. leaves a vacuum, others will fill it. The barbaric Islamic State of Iraq and al-Sham, or ISIS, is trying to build a base of operations in Iraq and Syria from which to attack the U.S. and its allies. The recent beheading of American journalist James Foley showed how serious ISIS is about "drowning" our nation in blood, as the group said in the video of the murder posted on YouTube. • Afghanistan. The administration says it still intends to pull out the remaining 30,000 troops by the end of 2016. If it does, the country will quickly become a terrorist haven once again. As with Iraq, the timetable seems to be mostly about the political calendar. The Obama administration seems to have lost the will to win. The terrorists have not. • Russia. President Obama was so intent on "resetting" U.S. relations with the Kremlin that he telegraphed a lack of resolve. President Vladimir Putin has only become more aggressive. That's led to Russian troops in Ukraine and Russian-supplied weapons shooting a passenger plane out of the sky. • An Iranian nuclear weapon. America's enemies have shown they are content to stall for time, while President Obama gets distracted. That's what's happening as the president continues to negotiate indefinitely on Iran's illicit nuclear program. An Obama administration desperate to strike a deal is likely to strike a bad one. It could leave in place an enrichment program that would be a pathway to a nuclear-armed Iran. • Syria. It has been more than three years since President Obama said the time had come for President Bashar Assad to step aside. The administration drew a "red line" on the use of chemical weapons, then did nothing when Assad crossed that line last summer. ISIS already has strongholds in Syria, while the Free Syrian Army desperately needs more U.S. assistance. • North Korea. The North Koreans continue to test nuclear weapons. They have held multiple tests of missile technology designed to reach the continental U.S. President Obama has done nothing at all about this. The White House has said its foreign policy rule is "don't do stupid stuff," but putting climate change ahead of global threats fails that simple test. The United Nations will hold yet another conference on climate change next month, while the world burns. 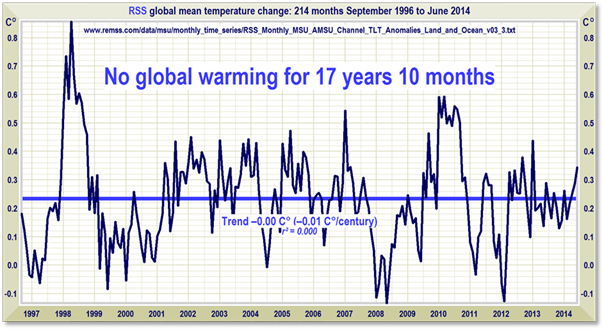 The greatest threat to Americans "right now" is not climate change. The greatest threat is people with the intent and capacity to do us harm—and the president's failure to lead the fight against them. Mr. Kerry's fixation on climate change is one reason America's friends no longer trust us and our enemies no longer fear us. The world is growing more dangerous as a result. Why did you link to this article? So what we need to do is get in more wars? That will save a lot of money. I was expecting something like what Lomborg does and instead got ignorant interventionist nonsense. I was excited about finding this site, and then ten minutes later I saw this article glorifying the U.S. bombing the entire world as a way of achieving world peace. Does the owner of hockeyschtick support this rabid warmonger? The enemy of my enemy is NOT my friend, if his intentions are even more destructive of my life, liberty, and property. Bombing is not mentioned one time in this article. The point of the article is there are far more important things for Obama & Kerry to be working on than the distraction of the global warming scam. I'm for peace whenever possible. Do you think ISIS is going to sit down at the table for peace talks?